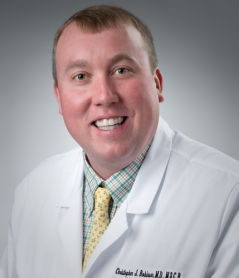 Dr. Christopher Robinson, a partner at Charleston Maternal Fetal Medicine, provides high risk pregnancy care to Bon Secours St. Francis Medical Center in Charleston, SC. Dr. Robinson is originally from upstate South Carolina and attended the Medical University of South Carolina for his medical training. He completed residency in Obstetrics and Gynecology and went on to complete a fellowship in Maternal Fetal Medicine and is a recognized national and international expert in hypertensive disease in pregnancy. Dr. Robinson currently serves on the Social Media Editorial Board of the American Journal of Obstetrics and Gynecology and is an Associate Editor for the American Journal of Perinatology. He is published and has expertise in the management of hypertension in pregnancy, fetal cardiac care, multiple gestation, and obesity affecting pregnancy. Dr. Robinson has held faculty positions with the Medical University of South Carolina, the University of South Carolina, the University of Wisconsin, the University of Illinois, and the University of Virginia. Dr. Robinson has been recognized as a National Best Doctor in Maternal Fetal Medicine from 2013 through 2016. He is active as the Chair of the Informatics Committee for the Society of Maternal Fetal Medicine. He has given regional and national presentations on management of hypertension in pregnancy and obesity and pregnancy care. He has also presented internationally in the areas of obesity and hypertension in pregnancy. He is married to Stephanie Ann Robinson and they have two children: CJ (11) and Aiden (7).